Subject encyclopedias are annotated in the sections on Russian subject resources. For example, Muzykal'naia entsiklopediia can be found on the page entitled Resources for Russian Music and Opera. Russkie entsiklopedii. Obshchie entsiklopedii. Bibliografiia i kratkie ocherki. I.M. Kaufman. Moskva: Biblioteka im. V.I. Lenina, 1960. 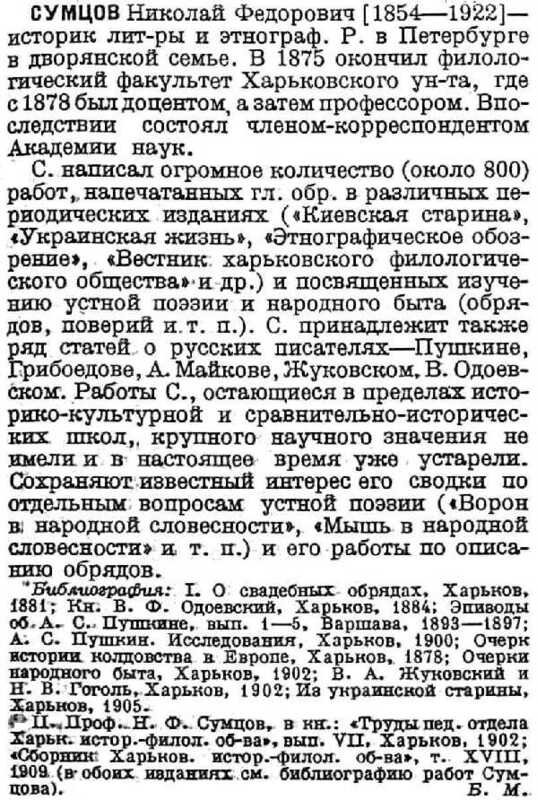 For descriptions of all the major general encyclopedias published in Russia and the Soviet Union between 1823 and 1960, Kaufman is hard to beat. The entries are arranged chronologically by publication date with a table of contents to provide an alphabetical listing of titles. 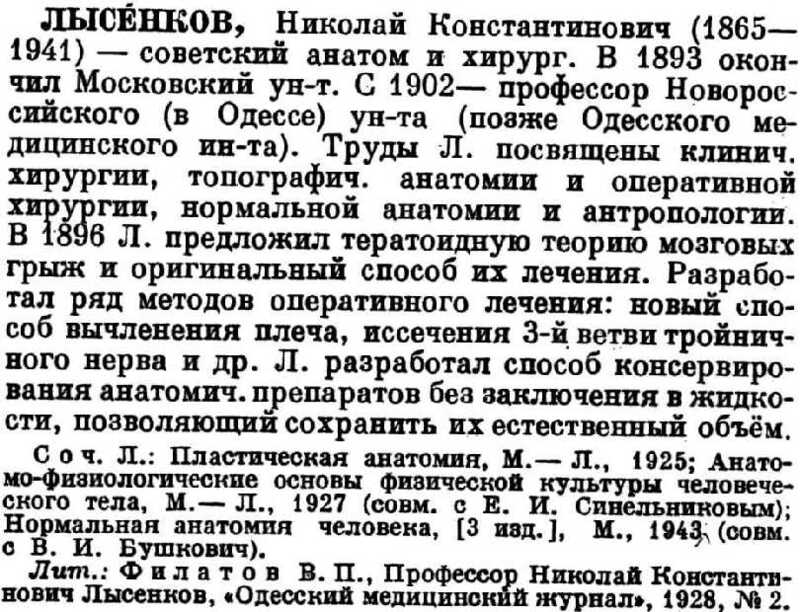 There is also a small bibliography of works about Russian encyclopedias. Each entry gives information on the organization and approach of the encyclopedia, a listing of the publication information of each individual volume as well as details on special topics embedded in various volumes. See the entry above for the three-volume Entsiklopedicheskii slovar' by Vvedenskii. This entry was chosen as a sample due to space considerations. The entries for the major encyclopedias such as the Granat are much longer. I.M. Kaufman. Moskva: Sovetskaia Rossiia, 1961. 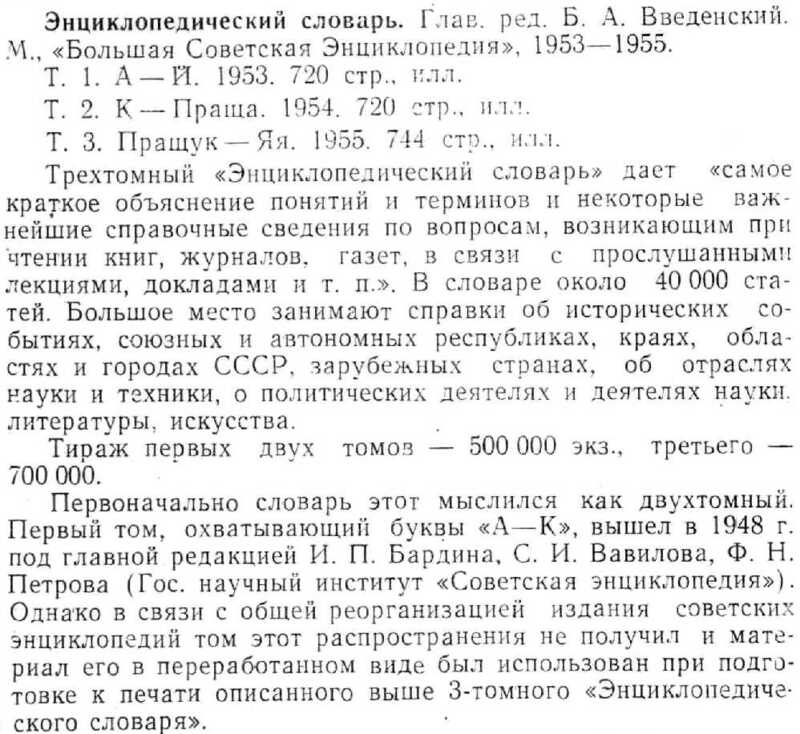 This is a guide to Russian special terminology dictionaries published before 1961. Many of the works described are subject encyclopedias. The entries are arranged by broad subject such as music, archaeology, transportation, etc. There is also an index of authors and titles and one for subjects. Entries contain bibliographic citations, details on the scope of the work, and information on special features. See the entry on the right for the Muzykal'nyi slovar' of 1884 which is an example of a subject dictionary containing biographical data. Sankt-Peterburg: Izd. F.A. Brokgauz & Efron, 1890-1907. Sankt-Peterburg: Izd. F.A. Brokgauz & Efron, 1911-1916. The Brokgauz is a scholarly encyclopedia with bibliographic references included in many of the articles. In addition to being an excellent source of biographical information, it also contains much 19th-century statistical data. Because the Brokgauz is an encyclopedia, it often is overlooked by researchers due to an anti-encyclopedia snobbishness, but its articles were written by the leading scholars of the day. Even the famous Russian chemist, Dmitrii Mendeleev, participated in the Brokgauz. S.A. Vengerov directed the literatary contributions to the Brokgauz while V.S. Solov'ev directed the philosophical ones. The encyclopedia was updated in the Novyi entsiklopedicheskii slovar' published 1911-1916, but was never completed due to the Revolution. It ends with the entry for "Otto". See the short entry below for the Russian family Zhukovskii as a sample for the first Brokgauz encyclopedia. Individual Zhukovskiis are listed in their own entries as is the Polish Zhukovskii family. Many of the articles in the encyclopedia are much longer than this entry, but we chose a short one due to space constraints. Entsiklopedicheskii slovar' Russkogo Bibliograficheskogo Instituta Granat. The Granat encyclopedia is unique in several respects. First, publication dates span before and after the Revolution so you can find information on people or topics that later became taboo such as Leon Trotsky. 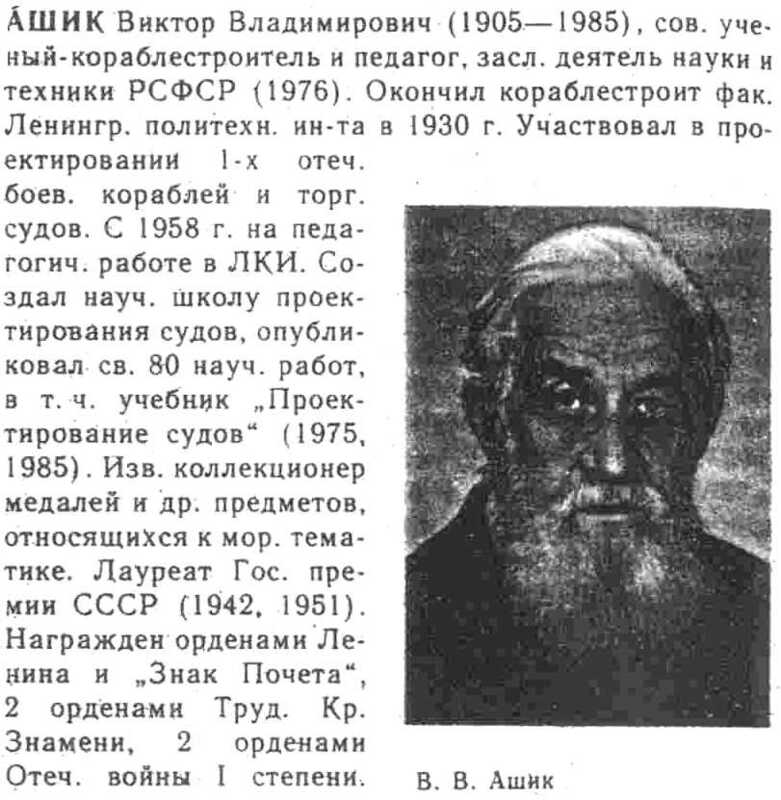 The later Soviet encyclopedias such as the various editions of the Bolshaia sovetskaia's do not contain entries for him although they do have articles on trotskizm. Second, it contains special sections that can be found only by serendipity or by using the guide to encyclopedias mentioned above. 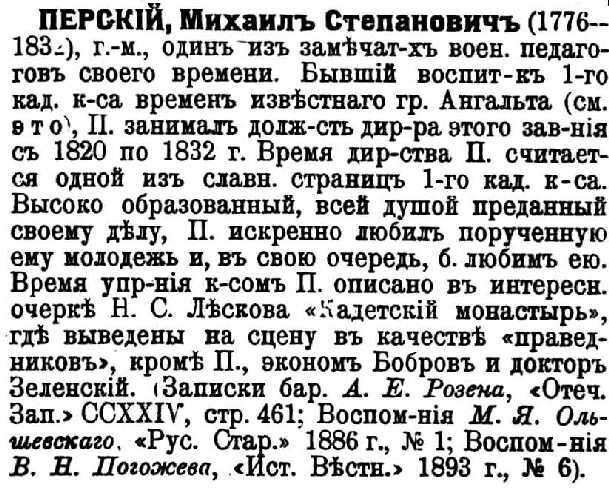 For example, in tom 11 there are entries about Russian writers contained in a special section entitled "Bio-bibliograficheskii ukazatel' noveishei russkoi belletristiki (1861-1911)". In tom 48 there is another special section entitled "Sovremennye deiateli nauki, literatury i iskusstva (1910-1929)", in tom 46 "Voennye deiateli epokhi mirovoi voiny", in tom 47 "Chleny Gosudarstvennogo Soveta s 1801 goda", etc. Another way the Granat differs from other encyclopedias is the extensive system of cross references. See the entry below on Trotsky which refers you to the section entitled "Deiateli SSSR..." instead of giving Trotsky his own entry under T. Volumes 1-29 were published before the Revolution and volumes 30-58 were published during the Soviet period. This basic Soviet encyclopedia is always helpful when looking for information on "good communists" and the Soviet interpretation of international and historical figures or events. Comparisons between the various editions can be interesting due to the varying degrees of censorship in effect during the different eras of publication. According to Horecky the second edition which was published in the 1950's reflects ideologically the time period in which it was published. In fact, regarding the second edition, the Russians even sent a recommendation to the Slavic Library that we replace certain pages with the enclosed "new pages" and an accompanying razor blade to assist in the task. See volume 5 and the article on Lavrentii Beriia which is what they wanted censored. Our original volume 5 (Beria article intact) has been transferred to the Closed Stacks area due to its bibliographic rarity and the volume 5 in the Russian Reference section is a later publication without the Beria article, but we tipped in photocopies of it and of the official request to remove it. All editions have bibliographical references. The final volume of the third edition is the name index which provides access to information about an individual that may appear outside of the individual's main entry. There is also a two-volume index to the second edition. See the entry above for the Soviet surgeon, Nikolai Lysenkov. Note the bibliographical references to works by and about him. A.A. Surkov, ed. Moskva: Sovetskaia entsiklopediia, 1962-1978. If you are looking for information on Russian literary figures, this scholarly encyclopedia should be your first stop. It is a basic resource for the study of Russian literature with signed articles on authors, movements, styles, and other topics related to literature. Entries include topics and personalities of world literature as well. Most entries have bibliographical references and some of the biographical ones have portraits. Entries are arranged alphabetically by surname or topic with additional entries for A to Ia appearing in the supplemental volume 9. Volume 9 also contains a detailed name-subject index to the whole set. See the entry on the poet, Ivan Petrovich Baukov. A.V. Lunacharskii, ed. et al. Moskva: Izd. kommunisticheskoi akademii, 1930-39. Published during the 1930's, this source reflects its time period with censorship and Soviet viewpoints. Nevertheless, it can be a valuable tool to discover basic information about Russian and Soviet writers and others connected with the field of literature. Many of the articles are lengthy and almost all have references for works by and about the individuals discussed. Many are signed by the scholars who wrote them. Some of the entries contain portraits. This version of the encyclopedia is more heavily censored than the later Kratkaia literaturnaia entsiklopediia which is discussed immediately above. Volume 10 of this set was never published. See the entry on Nikolai Fedorovich Sumtsov. The Modern Encyclopedia of Russian and Soviet History. + Supplement. = MERSH. Joseph L. Wieczynski, ed. Gulf Breeze, FL: Academic International Press, 1976-1996. UIUC Call Number: Russian Reference 947.003 M72 v.1-60, + 3 volumes of the supplement. For students who know only English, MERSH is a major source for information on Russian history and historical figures. The biographical entries include basic data as well as a discussion of the figure's historical significance. Bibliographic references are also provided. Use of the index volumes helps you find mentions of people who do not merit their own entry in the encyclopedia. The entries are arranged alphabetically by topic or surname. Some members of the nobility are listed under their first name, such as Alexander I and Alexander Nevskii. In the middle of volume 46 through volume 55 new entries from A to Z are listed. These volumes are called supplements. However, after the first 60 volumes appeared a new series entitled "Supplement" begins. The University of Illinois has the first three volumes of this supplement. Volumes 56-60 are indexes as follows: volume 56 is an index to authors and entries; volume 57 is an index to topics, for example, under Religion you can peruse all the entries that fall under that category; volume 58 is an index by historical time period; volumes 59-60 are more detailed indexes which can be particularly useful for biographical research. See the entry below for the ethnographer, Aleksandr Mikhailovich Zolotarev. Note the bibliography. V.V. Dmitriev, ed. Sankt-Peterburg: Sudostroenie, 1991-1994. This naval encyclopediia has over 7000 entries, many of which are biographical in nature. The types of individuals included are sailors, boatbuilders, writers, artists, and scholars. Most biographical articles are signed and provide basic biographical data, portraits, historical significance and a few bibliographical references. Entries are arranged alphabetically by topic or surname with a name index for people and boats. See the entry on to the left on V.V. Ashik. V.O. Novitskii, ed. Sankt-Peterburg: Izd-vo I.D. Sytina, 1911-1915. Although this prerevolutionary scholarly encyclopedia is included in the Russian biographical archive, it merits inclusion here as well. The biographical articles, many of which are written by military scholars, include basic life data, historical significance and often bibliographical references and portraits. The encyclopedia was never finished. It runs through P with the last entry on Port Arthur. 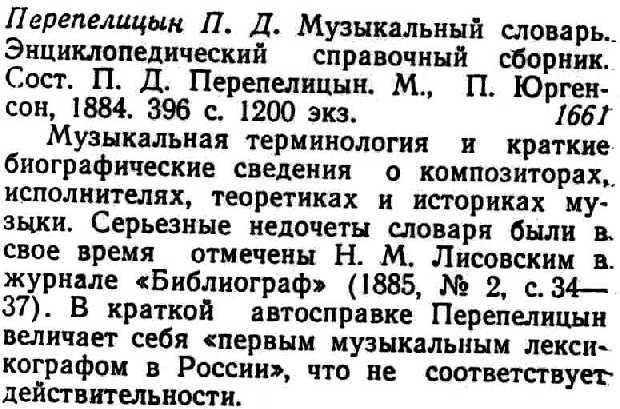 See the entry below on Mikhail Stepanovich Perskii.